August air hangs heavy, the torpor of late-day humidity enveloping like an unwanted quilt. The added heat of culinary pursuits is a topic best avoided. Until supper time. You could refrain from cooking altogether. What better way to avoid the kitchen than by savoring a perfectly ripened peach? Biting into the slightly acidic, heavenly sweet flesh, you feel the juicy perfumed essence sliding down your arms. You’re reminded of the sun setting on a Michigan lake, hues of orange, yellow and red spilling into the water – sort of like eating this peach. Experience has taught me to reserve peach eating for summertime. Peaches purchased in February are an altogether different species than the peaches to be savored today. Eating peaches at every meal is perfectly reasonable in August. Cookbooks and blogs are rife with the peach cobblers, crisps and pies of summer. Abundant spoonfuls of sticky sugar and honey combine with fruit, and are captured between layers of flour, oat and butter bindings. But frozen peaches, for me, perform admirably under these conditions. Consider exploring the savory side of a summer peach. A perfectly ripened peach has a natural sweetness so wonderful, for instance, paired with heirloom tomatoes and vinaigrettes. Or try grilling a peach half and enjoy it topped over a grilled chicken or duck breast. Sweet summer peaches, canned or bottled into salsas and chutneys, may be enjoyed long after autumn’s leaves have fallen. This recipe satisfies the summer appetite’s request for lighter fare, acknowledging the equally significant desire for a sturdy meal. When selecting the perfect peach, deeply inhale the aroma, which will be your first indicator of flavor; a peach should smell like a peach. 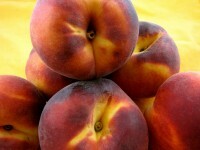 Then inspect the peach, rejecting any with soft spots or blemishes. As well, a greenish cast beneath the rosy pallor or at the stem end is a sign the peach was plucked before its time. If your peaches are firm, let them stand on the kitchen counter a few days or until they’re soft to the touch. If you’re cooking fresh peaches, they should be ripe but slightly firm to the touch. Preheat oven to 350°. Toast pecan halves, reserving chopped pecans. Wash peaches and cut in half (peaches often have a “seam”; this is where I cut). Remove pit and discard. With a melon baller or pointed spoon, scoop out some of the flesh, if necessary, so the pit is 1/2-inch deep. 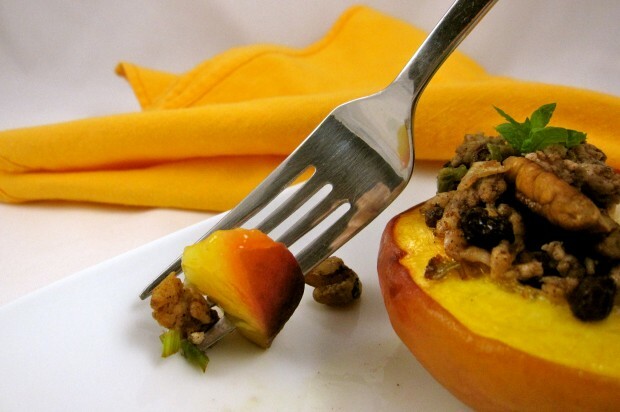 Place peach halves into a baking dish, with a 1-2 inch lip. Fill bottom of dish with 1/4-inch water. Divide 1 tablespoon butter into slivers and place butter, or oil, into the pit of each peach half. While peaches are baking, sauté leek and chopped pecans in oil or butter, until leeks are softened and nuts are toasty, about 4 minutes. Stir in cinnamon and allspice. Add ground turkey and sauté , breaking up with a fork, until just cooked through. Divide, mound and press turkey mixture into the peach pits. Tent with foil, return stuffed peaches to the oven, and bake for an additional 10-20 minutes, or until tender. Garnish with toasted pecan half and mint sprigs, if using.